When it comes to preparedness, you've got to cover the basics. Food and water, fire, shelter, first aid and rescue are what you are looking for. 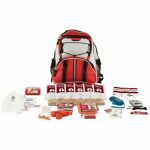 These basic survival packs have what you need in a ready to go backpack you can take anywhere. You get get very elaborate when putting together your own but everyone has to start somewhere and within what they can afford. 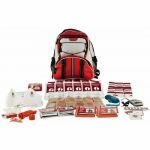 Having something is better than nothing and these kits have what it takes to get you through an ordeal.